Der weiß wohl, wo's das gibt. M a r t i n i - B a r .
Beim Kling-Klang rechts und links. "Wie schnell die Zeit entflieht! 3 page, circa 1' 45"
Knows quite well, where off to sneak. M a r t i n i B a r.
Right and left toasts bright resound. Are always an interesting lot. 'How fast does time fly by! Copyright © 2019 Gary Bachlund All international rights reserved. For other settings of Ringelnatz' texts, click here. 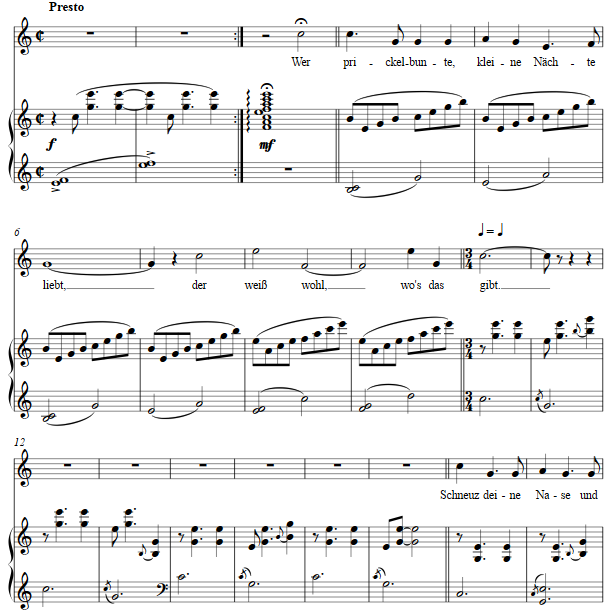 The score is available as a free PDF download, though any major commercial performance or recording of the work is prohibited without prior arrangement with the composer. Click on the graphic below for this art song score.